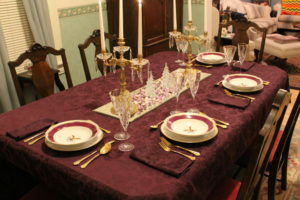 For the second Lincoln China dinner party table setting, I took away two of the place settings, leaving four so I could use my pretty Cassandra Gold stemware by Cris d’Arques (thrift store). I also switched out the flatware to Golden Royal Plume by Wm. Rogers (antiques store in Butte, MT). Everything else remained the same. I think out of all of the stemware I used for the various table settings, Cassandra Gold just seemed to go the best out of all of them. Do you agree? The Lincoln China with Cassandra Gold stemware and Golden Royal Plume flatware.